15 Looking to buy an HJC? The Symax modular has been around in one form or another for many years now. The latest iteration is the Sy-Max III, the third generation, which mates a fibreglass shell with a polycarbonate chin guard to offer a flip-up at the lower price end of the market. Here’s some of its main features… and read on for a full review of what owners think about the Sy-Max III (or Symax as it’s widely known). As usual, the Sy-Max III is both DOT and ECE 22.05 certified for sale in the US and Eu so it’s going to offer at least a reasonable level of protection. 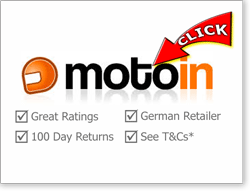 However, it has also been independently tested by the SHARP labs which rated it 3 stars out of 5 – which is pretty good (though check out our safest motorcycle helmet reviews to find four and five star rated helmets reviews). As you’ll probably know, we put a lot of emphasis on safety here at Billy’s Crash Helmets (if you’ve gotta wear a helmet, you might as wear a safe one!) so while the overall SHARP rating is OK, they also record the % of times the chin guard stays locked and closed during impact testing. And in the case of the Sy-Max III, the chin guard only stayed locked in 40% of the impacts. Now that’s a concern. If you’re buying a system helmet, you need the chin bar to stay locked if you have an accident and from the data, you can’t rely on that happening with the Sy-Max III. Other stuff that we’d consider contributes to improved safety (i.e. stopping you getting into an accident in the first place) are the optically-correct visor, the drop-down sun visor with it’s spring-loaded quick retraction mechanism and the Pinlock included in the box that’ll stop fogging on cold/rainy days. All good stuff. As always, the amount of helmet noise is very subjective, depending on how loud your last helmet was, type of bike (naked or faired) and – last but not least – how good your hearing is! That said, we always try and assess the overall level of noise in the lid as perceived by owners who actually use the helmet. Overall then, owners seem to rate the HJC Sy-Max III as about average compared to all helmets and pretty quiet for a modular (remember modulars are generally lots noisier than full face helmets). I’ve gotta say though, that this ignores the fact that a couple of folks said they had to return the SyMax because they found it just too loud. And conversely there’s some people who said it was quieter than their full face and they could talk happily on the phone via their bluetooth sets at fast motorway speeds. See how individual it is? Again though, generally the Symax seems pretty decent in suppressing noise compared to many flip-ups. 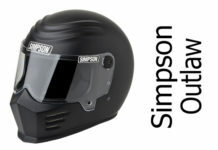 If a quiet helmet’s important to you, have a look at our quietest helmets page (you can see which helmets have this and lots of other features in our feature cloud in the right hand sidebar above). The Sy-Max III is created in two helmet sizes and available in fitment sizes XS to XXL. 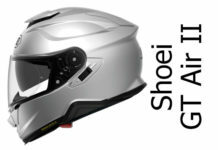 Read here why more crash helmet shell sizes are better than fewer. If you’re looking to buy a Sy-Max III then, it’s worth noting that quite a few people said they can be slightly under-sized, which means if you usually find you’re half way between a large and extra large for example, go for the larger size and you’ll probably find it fits just right. 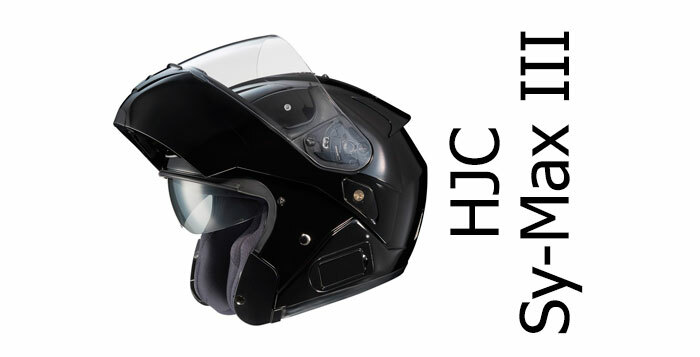 Do that after reading our helmet fitting guide of course, because getting a correctly fitting helmet is probably the single most important factor in getting a crash helmet that’ll protect you in an accident. There’s three vents in the front of the Sy-Max III and a couple of exhaust vents in the rear. The front chin vent is operated by pressing the large v-shaped toggle in the centre; press the bottom to open and top to close. That’s nice and easy to find and to open/close with gloved hands. The top visor isn’t. It’s a very small slider that opens two small vents to allow air into the top of the helmet. And while it works fine, it’s a bit too small to be easy to find and operate until you’ve got used to it. Overall though, owners reckon the airflow is OK. There’s a reasonable amount of air pushed over the front of the face and rear of the visor; though as usual, it’s not enough to keep the visor fog-free in cold weather (see visor section below) while the top vents let in enough air to keep things moderately cool in all but the hottest weather. It’s far from the best ventilated helmet around but it’s OK in most conditions. 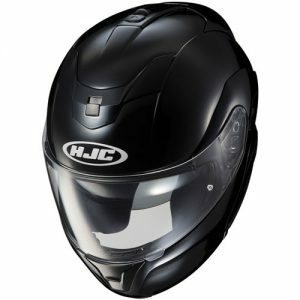 The HJC Sy-Max III has a good quality main clear visor and a spring-loaded drop down sun visor. The main visor is not exactly class-one optically-correct (the de-facto standard in distortion-free visors) but it’s very good, with a number of owners reporting no distortion and a nice wide aperture. It’s a ratchet opening and that works well with a number of very positive ‘detents’ or positions that the visor will open and stay at, including a ‘cracked open’ position for a bit of ventilation and clearing fog on the visor. It also has the opening tab to the bottom left which is well placed. It’s also Pinlock-ready and comes with a Pinlock anti-fog in the box. If you’ve never used a Pinlock, click the link above for more information on why they’re really handy. That’s a great selling point for the Sy-Max and worth around £30. The main visor gives 95% UV protection too. The integral sun visor is dropped-down by a slider on the top of the helmet with three positions – and it features a button allowing you to quickly retract the visor without having to move the slider. Owners like the sun visor on the Symax. They particularly like the way it drops down further than many other helmets with a few commenting that it can completely cover your vision and removes the need for sunglasses altogether. They do say the retract button is set very far back which is a bit awkward, but overall the system works well. Sy-Max III owners say the chin guard works well; it can be opened and closed with one hand and has a solid feel about it. However, as mentioned in the safety section, the chin guard only remained fully locked in 40% of impacts when tested by SHARP. Which isn’t good by anyone’s standards. 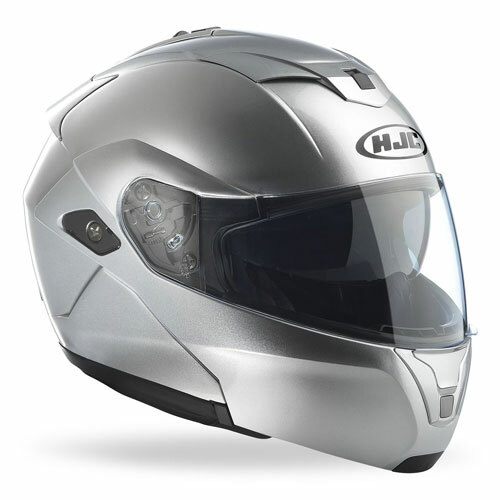 If you buy a flip-front helmet, you only want it to flip open when you decide… and especially not during an accident. SHARP doesn’t actually say it’ll flip open – each accident’s different so they can’t say whether it’ll put you in danger or not – but with the test impact causing it to become unlocked in 60% of test impacts, that’s gotta mean there’s more of a chance. 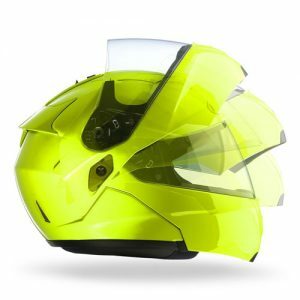 For some suggested safer modular helmets, check our suggested alternatives at the bottom of the review. The interior is what HJC call SilverCool. A few manufacturers have started using silver fibres weaved into their interiors as it has good anti-bacterial properties – though it’s usually reserved for helmets at the upper end of the price range. So having silver fabric inside the SyMax liner is pretty unusual in a lower priced helmet. The Sy-Max III padding is also moisture wicking, designed to pull sweat away from the scalp and, ideally, into the air channels and out of the exhaust vents. While the ventilation is about average (so don’t expect a totally dry head when things heat up), owners do rate the Sy-Max III as being very comfortable (again as long as you get the fitting right). A number of owners praised it as keeping them happy all day long on ten hour rides so the comfort lining seems to be doing its job nicely. On fitting – if you haven’t already, check the size section above for info of which size to buy – but note there are replacement cheek pads available for the SyMax should you want to fine-tune the fit further. One final thing to note in this section is that there’s a glasses groove in the internal lining which lets the stems of glasses sit inside the groove, stopping them pressing into the side of the head. That’s a great feature that many helmet makers have now adopted. The HJC Sy-Max III is available in a pretty standard range of solid colours. We’ve shown them all on this page, and it includes the usual matt & gloss black, solid white, a silver and a hi-viz yellow version. If you look around, you might also find the subtly-cool Sy-Max III Shadow that’s a matt-black version with grey piping. This guy gives you a quick-overview of the SyMax III. The Sy-Max III comes with a micrometric fastener (easy to use and quick-release). Build quality is pretty good although, according to a couple of owners, you might notice a few areas around the chin guard that aren’t quite up to scratch – if you look closely. And finally, the SyMax is designed to accommodate HJCs Chatterbox bluetooth system – with a removable section on the left hand side. Of course, many folks will already have a bluetooth they want to use with the SyMax III and there’s reports of people fitting both the Sena SMH-10 and the Cardo Scala Rider G9 without too many problems (though one owner struggled to fit their Scala G4). 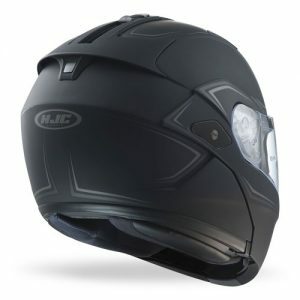 There’s lots of competition in the flip-up helmet market at this price point and some fabulous helmets to be found. 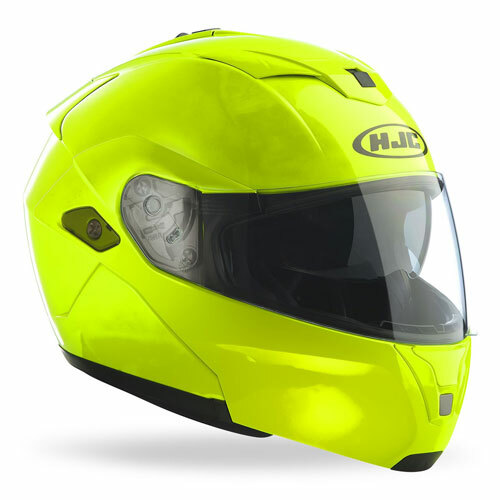 The AGV Compact is a SHARP 4 star rated modular with sun visor and free Pinlock. Then there’s the very light 4 star Lazer Monaco – a bit more expensive but a great helmet with a photochromic visor as standard. Finally, the excellent Cabergs – the Duke and the Tourmax – both 5 star rated and excellent buys. 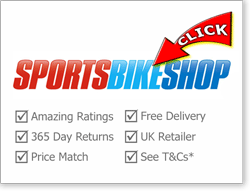 For more alternatives, why not check out our Top 10 flip up crash helmets page? Owners seem to like their SyMax IIIs. It’s pretty quiet (for a modular!) feels well-built, has a great pair of visors (with a free Pinlock in the box) and does everything pretty well. The only fly in the ointment is the SHARP safety score of 3 stars (out of 5) and the 40% rating for the chin bar. 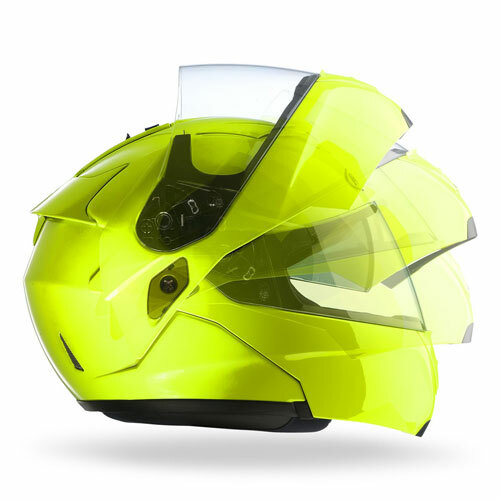 If you can live with that, in all other respects the SyMax is a well regarded helmet that’s easy to live with. Owners like their HJC Sy-Max IIIs. It does everything pretty well - has a good visor and sun visor, the chin guard operates well and it comes with a Pinlock anti-fog in the box. The only problem is it only scored three stars in the SHARP safety test and the chin guard didn't perform too well either. If those don't bother you, then the SyMax III is worth a go. Hi. I am so glad I found your website. I feel I have been educated after the event, plus I commend you on your in depth level of explanations of the regs end the labeling references on helmet straps etc. I would have expected that info on the Sharp website, if it is there I can’t find it. I have a HJC SY-MAX III, which until I read your review, then the Sharp info,was happy with. I guess the safety, especially the chin guard is cause for concern. 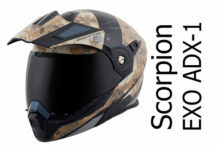 Your review says this helmet is only classed as being approved as an open faced helmet, however the strap label on mine has “P” after the numbers. Am I misunderstanding the labeling?